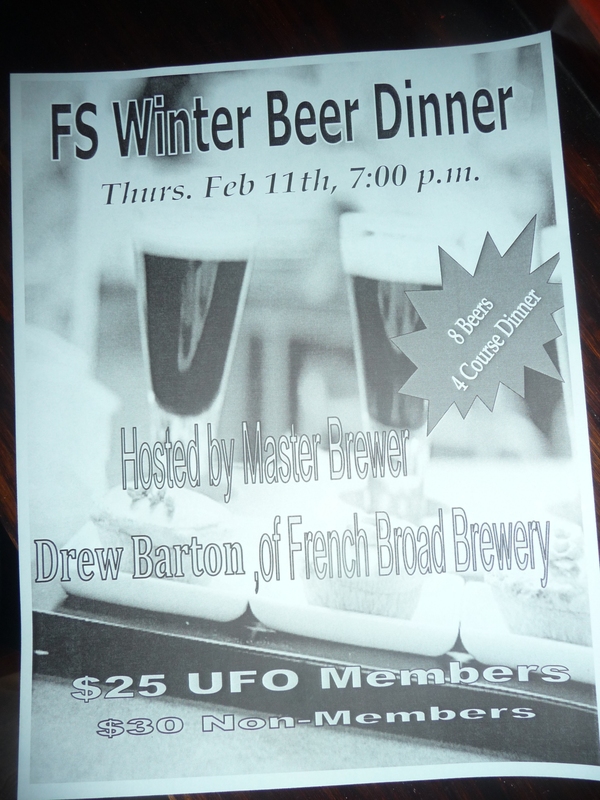 For the past week, I’ve heard rumors of an upcoming beer dinner at the Flying Saucer. Last night I got the details. Drew Barton, who worked at the Saucer years ago, then left to become a brew master, will present 8 of the beers from his brewery, French Broad. The beers will be served with a 4-course dinner. $25 for UFO members, $30 for non-members. $25 to sample 8 beers, and you get to eat, too? That’s a pretty good deal. It’s been 3 years since they had their last beer dinner and I’ve been waiting for another one. The last time they did one, they really hit a home run with the food. Can’t wait. Attn whichever manager is working night shift this Tuesday: Expect to be pestered by the Nuh-Uh Girl asking, “What kind of food are you having?” She’ll probably hint around that she’d like to come to the dinner for free too.